HGW: I was an ambulance attendant, EMT, in college. I was very interested in emergency care and saving lives, stuff like that. I also liked science, and I thought it would be really fun to learn about the biology of the human body, the biology of yourself. Those were my motivations that drew me to medical school. I didn’t know that I ultimately wanted to be a member of medical school faculty. My father was a faculty member at the University of Colorado. I didn’t know I would be involved in research because I thought I would be involved in political research and medicine. What made you come to Dartmouth? HGW: I have been at Dartmouth since 1990. I came and started as an employee at the [Veteran Affairs division] in White River Junction, where I worked for 20 years. I was also involved in research at the forerunner of The Dartmouth Institute. I came here to work with TDI founder Jack Wennberg, who put Dartmouth on the map for medicine. He started The Dartmouth Atlas of Healthcare by doing analyses of the epidemiology of the practice of medical care, how it is practiced in different places and how it has evolved over time. Epidemiology is all about patterns in health that vary across geography and across time. He made observations that what was a homogeneous and white middle-class place [New Hampshire] had wildly different medical care across towns. I did my fellowship at the University of Washington, and my adviser told me they were looking for someone at Dartmouth, so I applied and have stayed since. How have you seen Dartmouth’s role in medicine change over time? HGW: Over the course of my 27 years here, the stature of the ideas coming from Dartmouth — counter cultural ideas — has gained a lot of traction. There are a lot of people elsewhere in the country that look to Dartmouth to help explicate some of the unusual features of medical care that we can create demand for. 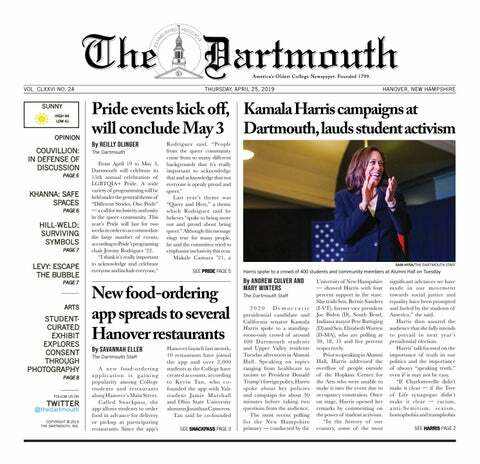 Dartmouth has offered counters to the whole idea that if you build more hospitals, more people will come, and more people will then be treated. The phenomenon is that “if you build it, they will come,” where you build more hospitals and more people are in the hospitals. If you start looking for early forms of disease, you are going to find a lot, more than you would expect. These are somewhat revolutionary ideas in medicine because it wasn’t all about patients’ needs. The current system has some very powerful influence over how much medical care people get. We have long been concerned about people not getting enough medical care, and in more recent years we realized we have to worry about the other side of the equation where people are getting too much medical care. Some people are not getting enough, but some people are getting too much, and it is not good for their health. What is your research regarding medical testing about? HGW: My role in research has been dealing with this assumption that sooner is always better. This is a very powerful assumption in healthcare, particularly for feared diseases like cancer, because we think that the best way to deal with it is to look for it early. It seems to make so much sense on the face of it, but it is not right. At least, it is not always right. The truth is whenever we look for early forms of disease, we find a lot more than we would ever expect. Ironically, because of our interest in early cancer detection, where I have focused a lot of my energy, there is an incredible heterogeneity in what we call cancer. That brings me to the barnyard pen of cancers, which is a way to think about the heterogeneity of cancer. The barnyard pen has three animals: the birds, the rabbits and the turtles — the goal of early detection is to catch those animals early and fence them in. The bird can’t be fenced. It has already flown away — they represent the fastest growing and most aggressive cancers that have already spread. Screening won’t help the bird; they are already missed and out of there. The rabbits are hopping around. You can catch them if you build the fence early. Detection has the potential to benefit slow growing cancers — the turtles are the cancers that aren’t going anywhere anyway. You don’t need any fences, but unfortunately our early detection efforts are really good at finding turtles. However, doctors can’t separate turtles from rabbits, and they treat everybody, which creates harmful early detection results. Breast, prostate and thyroid are all glands that have cellular abnormality in them. If we look really hard, we start finding that abnormality. What have been the effects of this early screening issue in specific cases and for the medical community in general? HGW: The poster child for the problem is South Korea. 15 years ago, doctors started doing ultrasound screening for thyroid cancer. Then 15 years later, there was a 15-fold increase in the incidence of thyroid cancer. Some people say that is an epidemic of disease. But, the death rate from thyroid cancer is totally stable. It doesn’t look like an epidemic of disease ­— it looks to me like an epidemic of diagnosis. In fact, the thyroid gland is known to harbor lots of small cancers, and yet pathologists also recognized that thyroid cancer was also an extremely rare form of cancer. You have all this reservoir of abnormalities that could be called cancer, but most of them could never go on to cause death. The end result is if you start looking for thyroid cancer, you find a lot of thyroid cancer, you scare a lot of people, take out a lot of thyroids, people need lifelong thyroid replacement and you don’t change their death rate. You are then treating them unnecessarily, which happened in South Korea. More important broadly, there is a lot of interest right now in the biotechnology community in testing people. Whether it’s biomarkers, immunosignatures, liquid biopsies, nanositiology, they got all these various technologies to test people, to try to predict or find early forms of disease. And I think everyone needs to understand that that is a double edged sword, that we all harbor abnormalities and increasingly our tests are able to find those abnormalities. That does not tell us what to do and creates a cycle of increasing anxiety and intervention that can harm patients. This is a general thing we all need to inoculate ourselves on. There’s this idea that you can test yourself to help, and we need to recognize first that over-testing may distract us from things that are more important and can start a chain of events that we wished had never started. What impact has your research had on medical practices and screening procedures and perceptions regarding early screening? HGW: We are getting to be more balanced now. More and more physicians — and an increasing portion of the public — understand that this is not as simple as it seems, that it is not always the right thing to do, looking hard for things to be wrong. It can be a recipe for turning people into patients unnecessarily. This is kind of a new idea. It started with the best of intentions where we said, “Wow, people have really bad diseases and bad things happen and the way to deal with it is to look for early forms of disease.” We didn’t anticipate that there are more forms than expected of those diseases. The first thing is that everybody needs to have a more healthy skepticism about the value of testing. For too long we think that we can decide later what we do after getting tested, but instead we need to decide upfront whether you want to do this testing. Once you have an abnormal test result, you are set back, which happens so much since we use so much testing. A lot of people are beginning to recognize that abnormalities occur due to increased testing, and that may start affecting both patients’ and physicians’ feelings about how much to test people and how to be tested. I don’t think a law about this is necessary, but I think that direct to consumer advertising of this stuff simply promotes its use and invariably over-promises and oversimplifies the full effects of what can happen. This is a very important point, that the use of these tests is typically associated with very misleading feedback. Going back to South Korea — the minute you look hard for thyroid cancer, there appears to be more out there, and you get a sense of epidemic. This feeds back to get people to test more and not look and see that there’s more to cancer. Now the typical thyroid cancer patient does better, their survival rate is higher, and they are less likely to have metastatic disease. They think that is great, but it is only because you told everyone they have thyroid cancer. If you told everyone they had cancer, survival rates would go through the roof, but that doesn’t mean you’re helping anyone. That is misleading because it is hard for people to wrap their head around. The problem is the measure because it can be biased by the addition of cases that are never going to matter. What is your class, Public Policy 26, “Health Policy and Clinical Practice,” all about? HGW: My class is a 10, and it is offered in the spring, and I have been teaching it for 7 years to cross the boundaries between health care and public policy. It is open to everybody, and every year it is about a quarter freshmen, quarter sophomores, etc. Honestly, sometimes the freshmen do better than the seniors. In the course we stress statistics and analyzing data because everyone needs to be able to understand numbers, i.e. what is big, what is small, what is being affected, what is this really measuring and what do I want to know. The course is really about critical thinking in the context of health care. The goals are to understand policy context and population perspective, develop skills such as management and quantitative analysis and to evaluate info and thinking about what the measures of something really are. A big part of it is to question underlying assumptions, since you are willing to ask, “Is that central belief, is that really right?” and it requires a bit of healthy skepticism. Some students have told me that the first two weeks of the class is a boot camp, and it is really focused on interpreting graphs and then playing with numbers in a spreadsheet to do simple things with it. This is the groundwork that allows us to go forward in the rest of the class to analyze different models and assess clinical practices based on data using simple algebra.